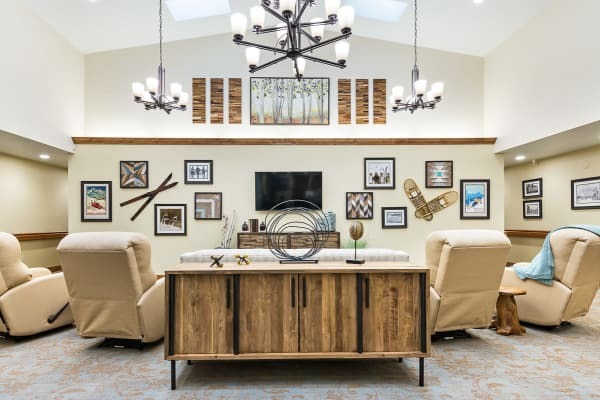 At Mill View Memory Care in Bend, OR, we strive to create a warm and engaging environment designed for the unique needs of those living with memory loss. Our approach to Memory Care fosters the utmost quality of living for seniors with Alzheimer’s or dementia. With the right combination of support, activities, and companionship, our residents discover new ways to embrace and even reclaim their independence. We take care of the chores and provide round-the-clock care while residents spend time getting to know one another and enjoying the bountiful amenities throughout the community. Every day at Mill View Memory Care is an opportunity to discover a new way to enjoy life. Our professional care teams provide assistance with the activities of daily living, such as bathing, dressing, housekeeping, and more. This allows residents to put their energy into activities which give each day a sense of purpose while also helping to engage the mind in meaningful ways. When it comes to mealtime, our onsite culinary teams serve up delicious meals which nourish the body and feed the soul as residents dine together in our cozy dining room. We look forward to showing you everything we have to offer at Mill View Memory Care. Call today to schedule a private tour and get to know our compassionate care professionals.